Maple Ridge City Council is subsidizing 400 bear-resistant organic bins to residents of Maple Ridge. These are available on a first-come, first-served basis through Ridge Meadows Recycling and can be ordered by filling out the online form below. Residents will be asked to pre-pay for the bins and either pick them up from the Recycling Depot or request delivery. Retail value of these bins is $200. Bulk purchase price is $150. With the $50 subsidy, residents will be able to purchase the bins for $100. These bins are a major criteria to achieving Bear Smart Community status due to their success in bear-interface areas in other communities. The goal of this program is to “address the root causes of bear/human conflicts, thereby reducing the risks to human safety and private property, as well as the number of bears that have to be destroyed each year. 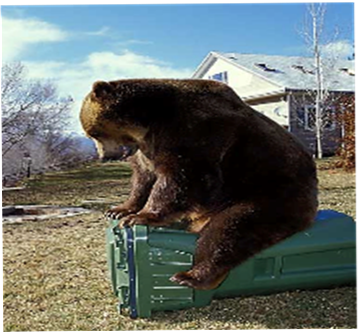 Because they can’t get into the secured, certified bear-resistant bins when properly used, bears are discouraged from seeking food sources in residential areas. Please place your order below. After your form is submitted, we will contact you to arrange payment & delivery. Thank you for helping keep our planet green! *Note: Rain Barrels, Solar Cones, & Composters only available to residents of Maple Ridge & Pitt Meadows. The City of Maple Ridge is providing a $50 subsidy for Bear-Resistant Organics Bins to Maple Ridge residents ONLY. Residents of Pitt Meadows can purchase bins for $150. Not at this time, thanks.